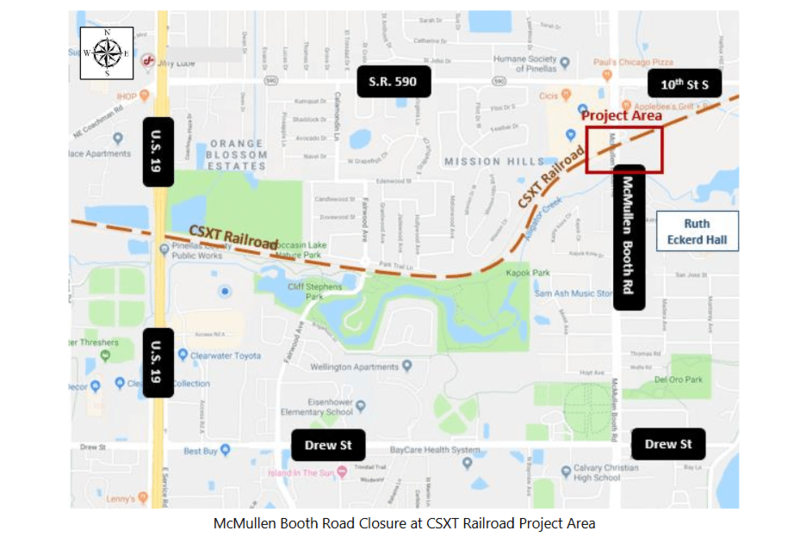 McMullen Booth Road will be closed temporarily between Drew Street and State Road 590 in both directions to all vehicles, pedestrians and bicycles for upgrades to the railroad crossing. The closure is scheduled to last until Tuesday (April 9). CLEARWATER – Pinellas County’s scheduled upgrades to the the CSXT railroad crossing on McMullen Booth Road just north of Ruth Eckerd Hall in Clearwater, will begin at 5 a.m. today (April 5). Normal traffic patterns will be interrupted during the morning commute and last about five days. *U.S. 19 will be used as the main north-south route. *State Road 580 and Drew Street will be the primary east-west routes. *Enterprise Road, Sunset Point Road and State Road 590 may be used as secondary east-west routes. *All truck traffic must use the primary detour routes. The upgrade is part of the county’s maintenance and railway improvement and replacement program. It includes replacement of damaged or undersized rails and rail bed with a pre-fabricated, tieless tub-style concrete crossing, as well as reconstruction of the roadway to improve safety. It is funded through Penny For Pinellas, the county’s local infrastructure sales tax. The closure is scheduled to last until Tuesday (April 9). Public safety services will remain unaffected. For information or project updates, call the Pinellas County Roadway Construction Information Line at (727) 453-3320 or go to pinellascounty.org/publicworks. Map courtesy of Pinellas County.